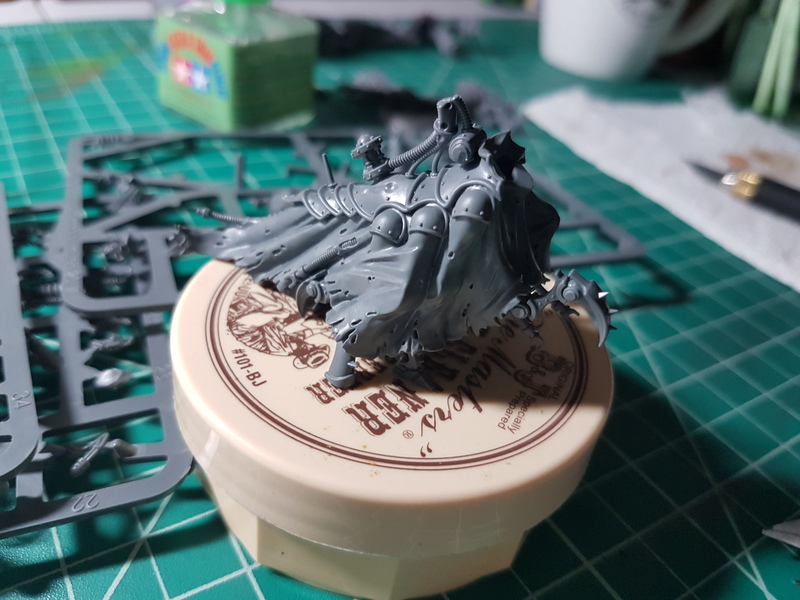 I have been spending the little hobby time that I have working on the Archmagos from the first Gathering Storm triumvirate while I eagerly await the next one, featuring a pretty neat character for my beloved Grey Knights. 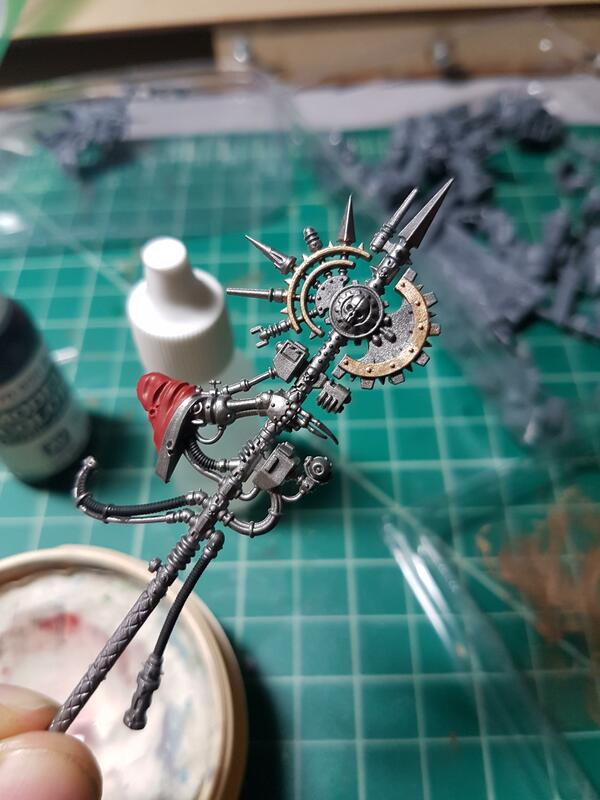 Duncan’s video on WarhammerTV was very, very helpful in doing this because Cawl is a very complex model with lots of little arms and such and the subassembly approach that they recommend is definitely the way to go. Here is the lower half of the main body. 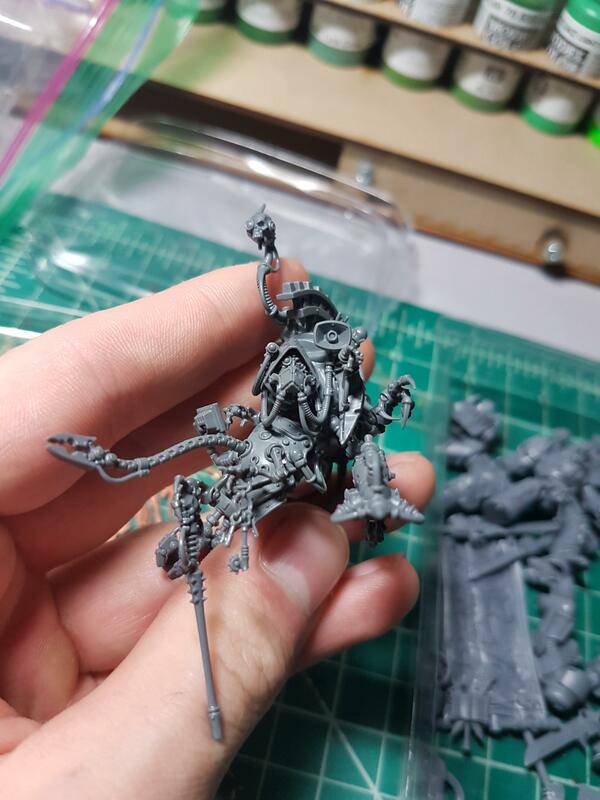 This is the simpler of the two body assemblies and is pretty straightforward to assemble, but I chose not to include the skull and tubing pictured in the background below. It projects out at a really strange angle and doesn’t really add much to the aesthetic of the figure. From this angle, you can see the addition of the small forward claw. It flexes pretty easily so it doesn’t inhibit your basing abilities too much. One of the cooler things about this fig is how much detail was put into things that most people will never see. Here is the top half of the figure. You can see here the first mistake I made – attaching the gas mask shaped part in front of his face. 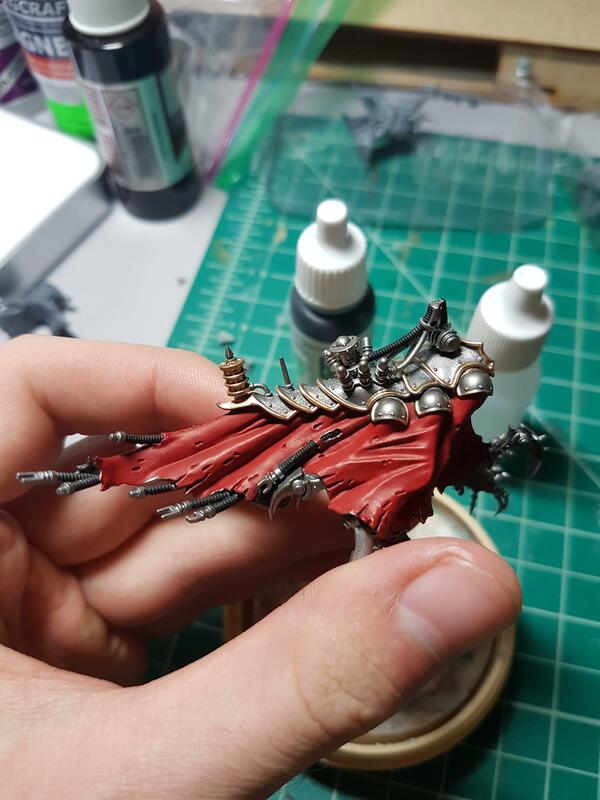 The side tubes would get in the way of painting the hood later on, as well as prevent me from using my brush on his chest region. As of now, those areas are left silver. There are also a motley collection of small arms and assorted appendages coming off his belly area. These also made it pretty difficult to do the gilding of the flat metal surface but short of gluing every single one on later it was something I just had to deal with. A rear view which also displays his cannon. 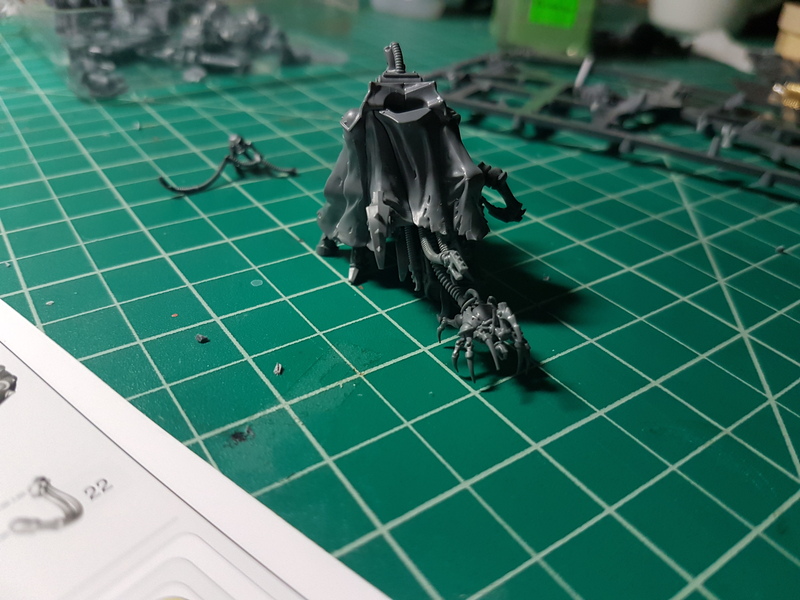 Priming was done outside with the same rattlecan that I used for Greyfax – GW Leadbelcher. While the finish with an airbrush might be marginally better, I find how much quicker this goes to be well worth it. It isn’t quite as smooth but definitely gets the job done. The axe. 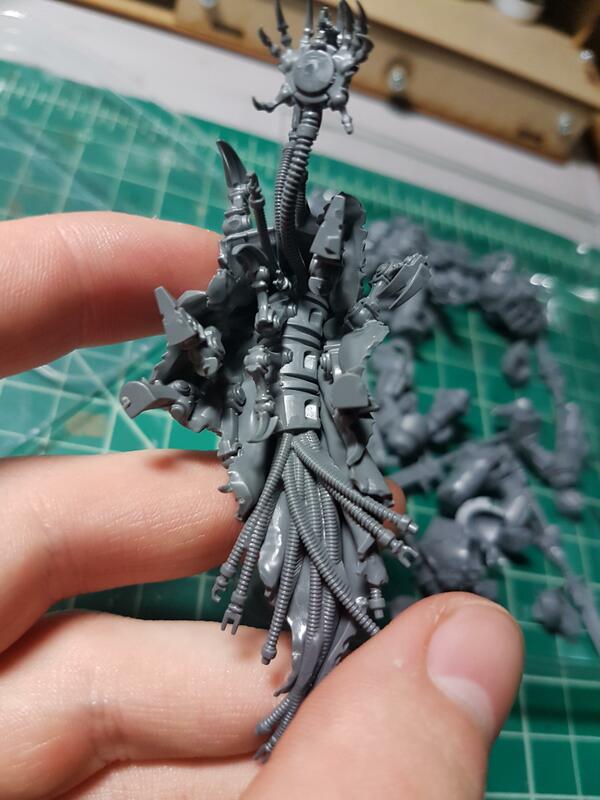 If you attach this right away the upper torso becomes an even crazier tangle of cables and arms and I just wasn’t having that. This piece also served as the first part to work on colors with, above you have Vallejo Old Gold, Mephiston Red and Vallejo Flat Black. And here is where I am at now. 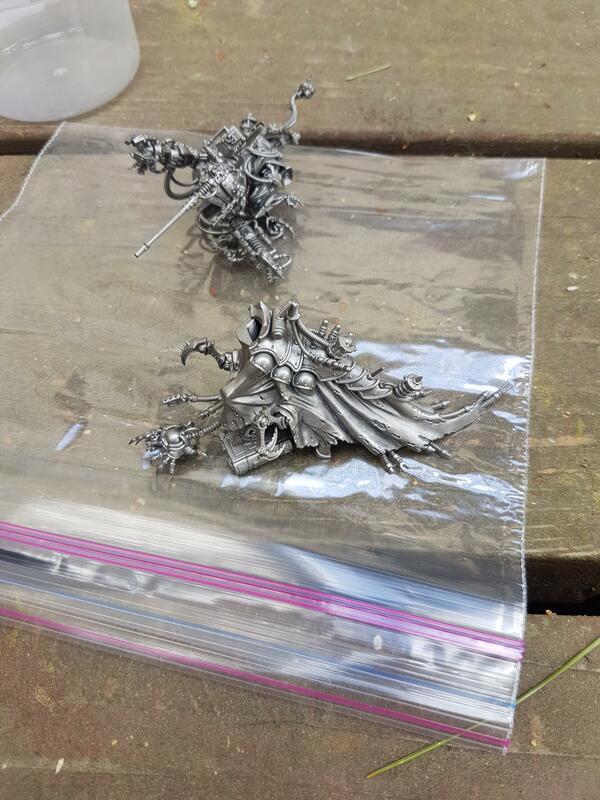 Most of the base coating is done with the exception of a few silver edges that need to be cleaned up. Next up is washing and drybrushing the metal, followed by the coat. Until next time! A nice post mate. 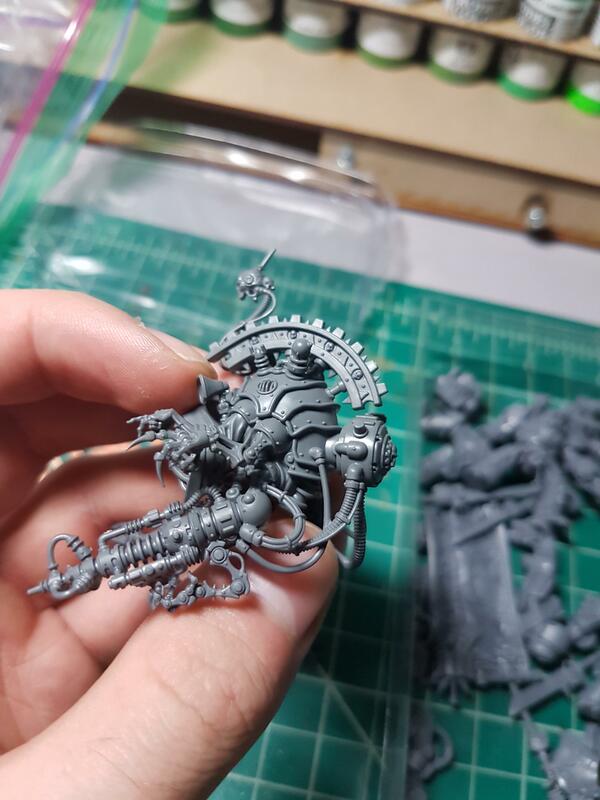 Great mini. I need to get me one of those!